Watch Kyle Anderson anticipate the defensive rotations, the effectiveness of a slow pick-and-roll, and Denver's Floppy defense. 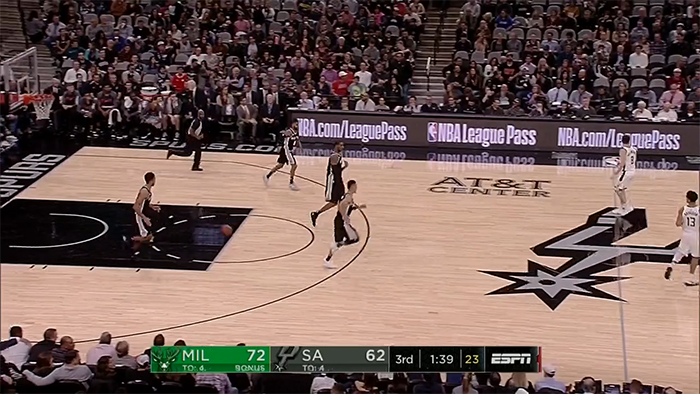 This is what great passers do — they recognize patterns. It’s not a matter of reacting, it’s a matter of anticipating. They know how defenses will rotate, and foreseeing those movements, make the next play. To paraphrase the famous Wayne Gretzky quote: great players make the pass to where the open man is going to be, not where he is. LeBron is incredible at this. On many of his drives he makes the pass as early as possible, just as the second rotation is about to kick in. He’ll head to the rim, the help will take a step toward him, the next man will just start to tilt to sink — and LeBron will fire a missile past him to the open corner shooter. This anticipation might suggest that teams could throw off these great passers by making defenses more random or haphazard, but there’s a reason they have rules in the first place: defenses need rules in order to operate as a unit. But if the offense knows those rules, they also know what’s about to happen, and they can take advantage of it.